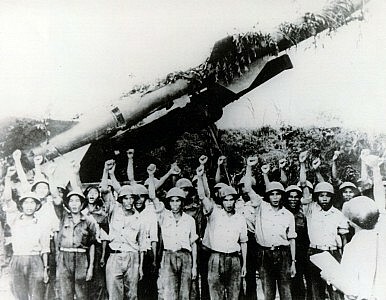 The North Vietnamese government lobbied extensively to rally international support to its cause during the 60s and 70s. The impact of Vietnam on the radical imagination of the late 1960s is hard to overstate. Antiwar, feminist, anti-colonial, and other groups took inspiration from the struggle of the Vietnamese people in their war against the United States. These included those focused mainly on domestic political issues, including Western European groups that ran the gamut between pacifist philosophical organizations to terrorist gangs, but also groups concentrating on comparable struggles, such as Palestinian fighters. A recent lecture by Lien Hang Nguyen discusses Hanoi’s efforts to build a revolutionary international coalition opposed to U.S. intervention in the war. This included targeted outreach at feminist groups, black militant organizations, Palestinian groups, artist collectives, and others. These efforts did not always work; sometimes, the particular appeals made by DRV officials fell flat in front of Western audiences. Nevertheless, Hanoi’s efforts at public diplomacy helped to undercut European and broader international support for American efforts in Vietnam. In a sense, the Western vision of Vietnam during the war was dependent on a pair of dueling fantasies. The official version viewed South Vietnam as a paragon of anti-communism, the frontline of conflict between the Soviet bloc and the free world. This vision bore little resemblance to the corrupt, inept reality of the Republic of Vietnam. The second fantasy, held by counter-culture and anti-war elements, saw the Vietnam War as the epicenter of global anti-colonialist struggle. This perspective both elided the huge differences and major conflicts between different kinds of activist groups, and ignored the brutal reality of life inside the Democratic Republic of Vietnam. These visions fed off one another, with different communities deriving what they wanted from the course and conduct of the war. But the second, apparently confirmed by the victory of the DRV in 1975, has endured and has a lasting impact on the global activist community. With distance, two things have happened. First, the authoritarian nature of the DRV has become increasingly impossible to deny; as Lien-Hang Nguyen detailed in her previous book, the DRV defeated South Vietnam in no small part because state repression allowed it to take fuller advantage of national capabilities. It is a curious thing that such an internally brutal regime became a symbol of anti-imperial virtue, but the Cold War made for odd bedfellows. Second, the United States and the DRV have grown inexorably closer together since the 1990s, with economic and even military connections increasing at a rapid rate. Far from serving as vanguard of international revolution, the Democratic Republic of Vietnam now acts as an increasingly important bulwark of the U.S. system for containing the People’s Republic of China. Reality has undercut both the fears of the mainstream and the hopes of the radicals.